Renovating the kitchen (and the den) has brought it home to us once again what a great and underrated architect Andrew Geller is. 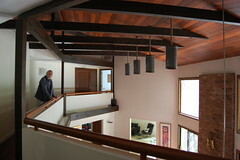 The built-ins in the den that were not part of the original blueprints boxed in the room, making it feel darker and smaller, and the platform cut the flow on the ground (first) floor. Removing them not only makes the space feel much lighter but now we can truly appreciate the architecture. You see immediately that the kitchen is the same shape and size as the great room - a trapezoid - and the den is a rectangle. It all feels much simpler now... and right. It's a fortuitous coincidence that just as we are finishing updating this uniquely modern Andrew Geller designed house, we hear that the iconic Pearlroth House has been approved for the National Register of Historic Homes. This is great news for all lovers of mid-century architecture - I can't wait to see the restored beach house. Then we got word that Jake Gorst, grandson of the architect, has embarked on an enormous project: founding the Andrew Geller Architectural Archive Preservation Project to identify, catalogue and preserve Geller's documents, drawings, photographs and memos - and he will film the whole process, including site visits to the architect's commercial and residential buildings, releasing a documentary in the coming year. 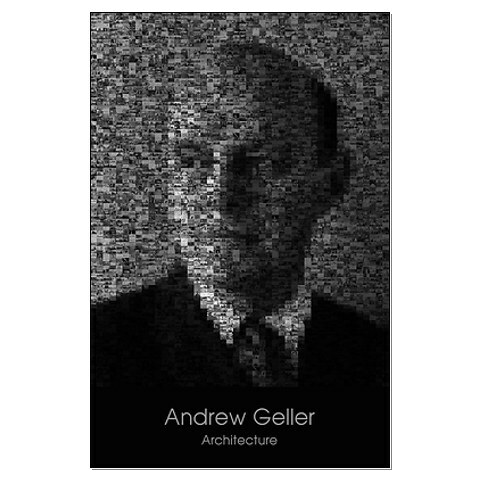 To support this project visit the Project: Preservation of the Andrew Geller Architectural Archive - it's tax-deductible! 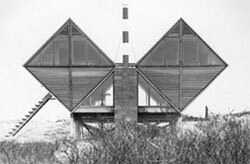 By the way, for those in the Long Island area, Jake Gorst's 2005 documentary, Leisurama the story of Montauk's "swanky" mid-century modular home community, will be played on PBS WLIW21 at 2 AM and 9 PM Saturday June 26. This is not to be missed!